Like most things at the company behind the successful Gulliver's theme parks, it was a family affair when work got underway on their new £37m leisure resort in Rotherham. Planning permission was granted in March last year for Gulliver's Valley - the first of Gulliver's sites in the UK to encompass all their major family entertainment elements in one location with new attractions exclusive to Rotherham. And when work recently began on the former Pithouse West former colliery site, it was company founder Ray Phillips and son Nick, who marked out the location for the centrepiece castle at the heart of the park. Nick and sister Julie Dalton now head up the Gulliver's firm as it celebrates its 40th anniversary this year. 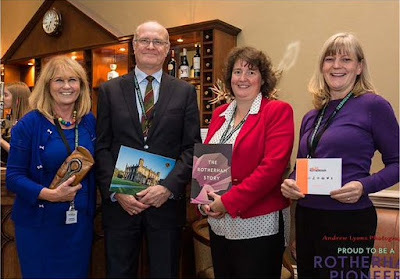 Julie was at a recent meeting of the Rotherham Pioneers to give an update on the Rotherham project which is the largest the firm has ever undertaken. "If I say it quickly, it doesn't sound as scary," Julie joked. The aim of the Pioneers initiative is to bring together the knowledge, networks and influences locally to promote Rotherham as a great place to do business. Gulliver's is a founder partner and the latest event focused on leisure and culture and was hosted by Rotherham Golf Club. Gulliver's is purchasing 250 acres of land from Rotherham Council adjacent to Rother Valley Country Park that was previously an area of opencast mineworkings. Following on from theme parks in Warrington, Matlock Bath and Milton Keynes, Gulliver's Valley is to be a year round destination aimed at 2 - 13 year olds and include a theme park hub, woodland adventure centre, ecology and education centre, lodges, hotels and a holiday village. Enthusiastic Julie (who admitted she still enjoyed dressing up as the firm's Gully Mouse mascot) described the land as "a huge playground" where the original Matlock site, which opened in 1978, would take up just a small part of. Dalton (pictured below, second right) said: "Both of our parents were teachers, although Dad only lasted a week! He was a serial entrepreneur and tried lots of things, one of which was building timber framed housing. "He managed to secure planning permission for a miniature village on derelict land in Matlock which the whole family got involved in building - in the shed, the garage, the kitchen, the lounge - everywhere." The village was designed for the family's own children to enjoy and opened when Julie was seven years old and already had a love for the industry. "This is our 40th year in business as a family and we still have the same values - it's about providing the best day out and enjoying doing it," she said. Working as a family with new ideas and adding new attractions, the Matlock site, and its steep hillside, was soon filled. Parks two and three in Warrington (1989) and Milton Keynes (1999) showed that Gulliver's had to "take the parks to the people." 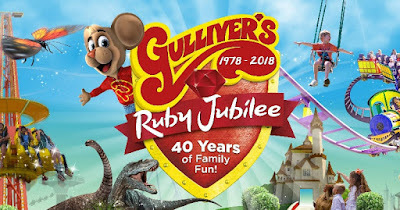 The fortunes of the industry in the UK has seen a number of parks close but during the most recent recession, Gulliver's were able to continue to grow without making any redundancies. It looked at the boom in soft play centres and came up with new attractions focused on the two hour market (rather than the whole day). An indoor splash zone and a Nerf centre (an idea from Julie's son) will also be created at Gulliver's Valley. The next target market was overnight stays - hotels with family first designs - which provided a return on investment within 18 months. Camping in proper tents again proved that the short break market exists. Most of the work is done in house - from the timber construction, metalwork and fibreglass to the creative side such as designing rides, writing shows and creating costumes. Gulliver's Valley is set to have a hotel with various themed rooms, a Wilderness hotel and 300 themed lodges. Julie explained: "Everything is about experience. Center Parcs is great but it is wooden lodges and that's it. When you come to us you can be a spaceman, a cowboy, a princess. "It's about creating magical moments." Plans are being updated and Gulliver's are also exploring options to bring forward the delivery of the accommodation provision into the first phase. Set to open in 2020, phase one includes the main theme park with three themed areas, the entrance hub and castle. Rotherham Council is also on site at Rother Valley creating a new £3.7m campsite. Dalton discussed the Rotherham investment, saying: "From our first meeting with Rotherham Council, we met with something we've not encountered at any other council and that's a drive and a passion to turn the place around. "The friendly, helpful people here have given us the opportunity to do anything. They've taken a chance on our family. And we are a bit nutty. "This is the right place and we will create a resort that will be world class." This should create jobs in the area but there needs to be some involvement with local agencies, businesses to ensure these go to local people, both in the construction stages and once the park is open. Put your trust in the local people and let them be part of this project. That will build confidence in the area and the business.